This web site is designed for Cardiologists, Radiologists, and other specialists who want the most detailed and complete training in cardiac CT. However, if you are a patient who would like to participate in either our clinical or research program, you are welcome to do so. 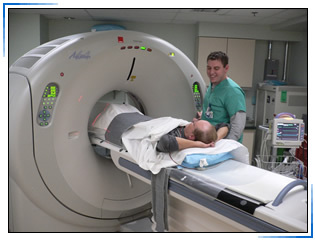 There are two types of cardiac exams that can be performed using CT. The first exam is called a “calcium scan”. This study detects calcium deposits in the walls of the coronary arteries, and is best used in patients at risk for coronary artery disease but without symptoms. The test supplements the use of conventional risk factors for predicting who is at risk for the development of symptomatic coronary disease. The second exam is called “cardiac CT angiography”. This test provides images of the coronary arteries, and may detect obstructions of the coronary arteries due to atherosclerotic plaque, and also may detect early atherosclerosis before obstructions develop. It provides information similar to what would be revealed by cardiac catheterization, but without the need for placing catheters into the heart. CT angiography can “rule out” coronary artery disease, and a normal study is generally considered definitive evidence that coronary disease is not present. However, if obstructions ARE seen by CT, catheterization is often necessary to confirm their presence and establish a therapeutic plan. Cardiac catheterization is indicated to rule out coronary disease but there is a contraindication or hesitancy to order this invasive test. Stress testing has been performed but has not resulted in a definite diagnosis. Evaluation of chest pain is necessary in patients with an “intermediate probability” of having disease who cannot perform a definitive stress test. Evaluation of acute chest pain is needed quickly. There is weakness of the heart muscle (cardiomyopathy) and the presence or absence of obstructions of the coronary arteries must be determined. There is an extremely high risk of coronary artery disease and stress testing and calcium scanning are not thought to be adequate for guiding preventative therapy. Heart rhythm disturbances (particularly atrial fibrillation) are present and catheter ablation is planned. Bi-ventricular cardiac pacing is planned and knowledge of the course of the cardiac veins is required. Congenital heart disease is present or suspected. Disease of the membrane surrounding the heart is suspected. A cardiac tumor or mass is present or suspected. Dissection of the aorta is suspected. A blood clot in the lungs is suspected. Other indications as determined by your physician are present.